← How to travel without going anywhere…if Kant could do it, why not you? 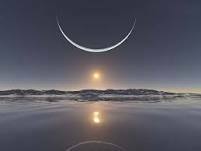 This year’s Solstice thus takes place at the very end of Moondark, the hidden 2-3 day period each month when the fragile, waning crescent Moon dies into the darkness from which the next New Moon is born. Moondark in ancient times was a time of retreat, of reflection. People avoided travel at those times since there was no light to guide their footsteps, making the nighttime world even more dangerous than usual. This seems to be appropriate to the atmosphere world-wide as a particularly grim year comes to an end amid a welter of extremist violence, with especial reference to the ‘massacre of the innocents’ which took place in Peshawar, Pakistan only this week. In the meantime, we humans in the Northern Hemisphere, beset by darkness and cold, need light and celebration to lift our spirits, no matter how much bleak world affairs or the pains of everyday life hold us down. At last year’s Winter Solstice, I published a wonderful poem by Susan Cooper which depicts the history and expression of this need with vivid beauty. Many of my readers have requested me to publish it again this year. This entry was posted in 02 - New Posts: January 2014 onwards, Experiences of Oneness / the Source (article archive), Healing - the power of Nature (article archive), Winter Nights - embracing the darkness, Working with Moondark and tagged Massacre of the Innocents, Moondark, New Moon in Capricorn, Susan Cooper, The Shortest Day, Waning Crescent Moon, Winter Solstice 2014. Bookmark the permalink. Thank you, Anne, for this wonderful Solstice post. Susan Cooper’s poem will be shared at an open mic this afternoon, of course, giving her due credit. Many thanks, Leslie – delighted to hear that the poem is getting some more exposure since it really deserves to be widely read. My husband mused today, “darkest day of the year, and you were born.” Ouch! I’ve always hated my birthday. The only light is that my fav Gran was born on the 20th & she always said I was her birthday present. I am her age now, the year I was born. Must mean something. For Ellis: Many believe the Winter Solstice is the true New Year. “Winter Solstice is the day when light is reborn out of the darkness of winter. Our days start to become longer and lead us back to the beauty of spring and the warmth of summer, stretching towards their peak at the Summer Solstice. Thanks, Leslie. It is a nice way to view it! Well, Ellis, I was born on the last hours of Moondark, with both my Sun and Moon in Leo in the Twelfth House which concerns all that lies beyond this world. One of the gifts of Darkness – which we were both born into in different ways – is that our natures and our spirit take us deep, deep where other folk cannot go, or fear going….there are great riches to be mined there, and from what I know of you through your writing and your ‘feel’ you have both mined those riches, and shared them. Surely that is something to value? Sisters born in darkness, always seeking the light. Maybe that is the root of the search. What a wonderful reminder of the call to go within, bid by every Winter Solstice, but this one especially. I love the Susan Cooper poem and have used it in winter solstice ceremonies for years. I can never see it or hear it often enough. Happy Yule with warm thanks for all you do to bring light to our world, especially for those of us who see our interconnection in the stars. Blessings, Anne! And blessing to you, too, Joyce, with thanks for visiting on this highly – charged day. Glad you too know about and share Susan Cooper’s wonderful poem. So strange, I told a friend, that this year the Solstice hasn’t touched my imagination as it usually does. I suspect a too-deep immersion in the sad realities of life in this country just now: distressing, and also distracting. There is a bit of rage inside at the stupidity and cupidity of the leaders of our country, which I have to expend a good bit of energy to keep out of my posts, and there’s no question that is playing a role. So, perhaps this year, the fact of Solstice and the turning of the world needs to be enough. Susan’s poem is a wonderful way to start reclaiming the mystery and beauty of this time.